In May of 1970, myself and a couple thousand others participated in an illegal rock festival on Lime Kiln Road. It was little more than a local affair, drawing folks from around the foothills and Sacramento. 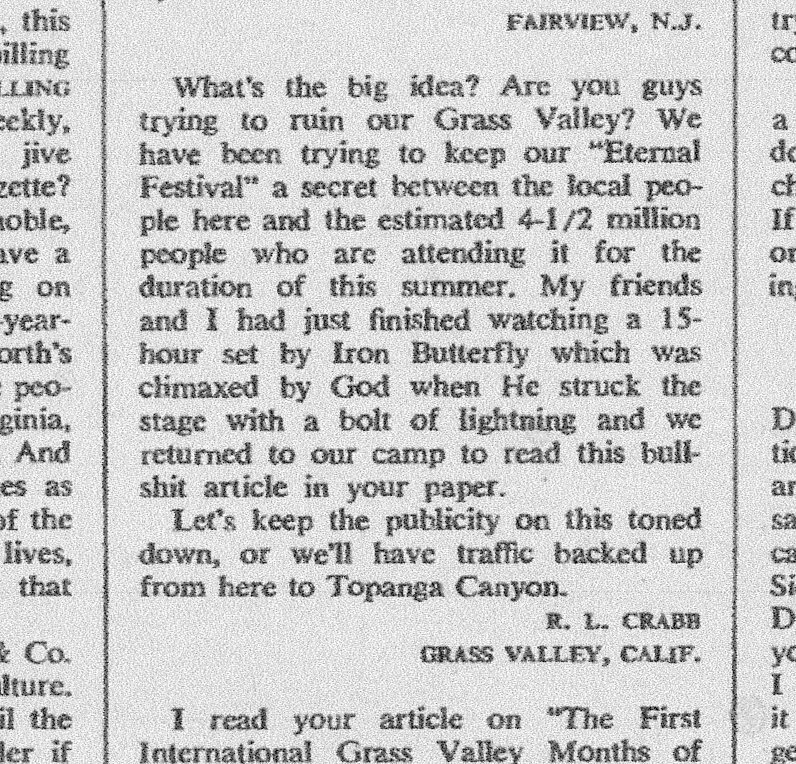 There was a short blurb about it in Rolling Stone magazine, and one of the staff was amused by the name “Grass” Valley. This person (who wrote without a byline) wrote a satirical article about the Eternal Festival in Grass Valley, featuring every big name act in the biz and scheduled to run from May to Thanksgiving. This entry was posted in Culture, History, Local. Bookmark the permalink. Let’s see now; May of 1970: having just completed a recovery mission for the Apollo 12 capsule splashdown the previous year, (50 years ago in November), I found myself at the helm of a 469 ft ship on it’s way to the Mediterranean. In a somewhat interesting note; having joined the Navy from Menlo Park, where I was working for my brother-in-law printing the Whole Earth Catalog, I was astounded to see some of my classmates in the company ahead of mine, (Jim Caldwell, Mark Harrit, Scott Fry, and Rick Metz). Didn’t get to join in the local concert scene until late in ’73.